In a losing effort, RB Jahir Waterman (#27) caught three touchdown passes. CATHEDRAL CATHOLIC (04/29/2014) A hard fought battle between two teams known as the Enforcers came down to the final minute. Leading 27-21, the San Diego Enforcers (2-1) gave up an 11-yard touchdown pass with 56 seconds left to play. A successful extra point proved to be the game-winner as the Inland Empire Enforcers escaped with a 28-27 win. An attempt at a game-winning drive fell short after quarterback J.J. Carrell's pass was picked off by defensive back Stephen Izumi. 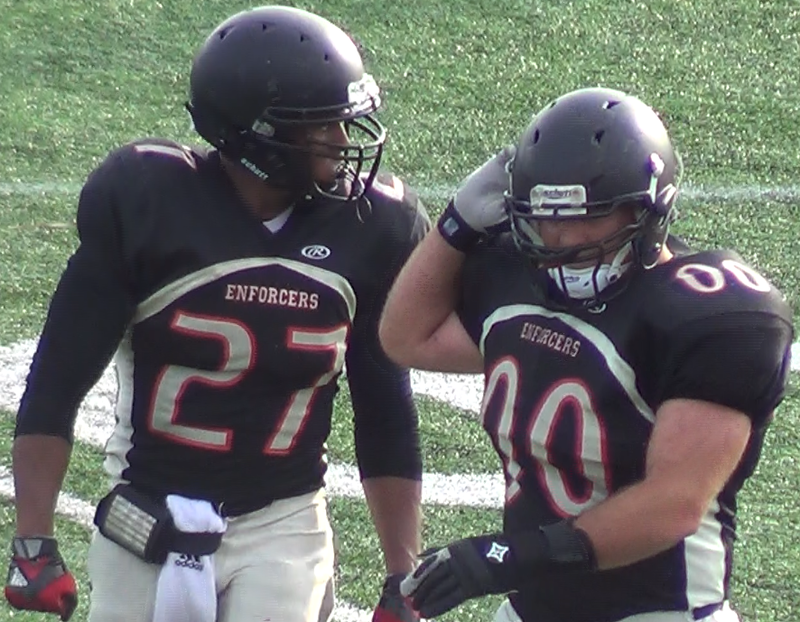 The Enforcers got off to a hot start taking a 14-0 lead early in the first quarter after two touchdown passes from Carrell to running back Jahir Waterman. After Inland Empire struck back with three unanswered touchdowns, Carrell connected with Waterman for the third time to tie it 21-21 at halftime. In the second half, the Enforcers were only able to score off two field goals by kicker Jose Pineda. The San Diego Enforcers will have three weeks off before they travel to Los Angeles to face the LAPD Centurions on Saturday, April 19th.